Watermark Engineering Resources begins every project by really listening to our clients’ priorities and vision. After conducting thorough due diligence during the planning phases of each project, we go to work developing the detailed engineering plans required to take the project to completion. Our focus is to help our clients navigate around any challenges presented during the due diligence phase so your projects remain on schedule. We work collaboratively with our clients and your success is our mission every step of the way. After a Site Plan has been determined, it is important to understand how the site will be engineered in a cost-effective manner. To determine this, Watermark will provide conceptual grading, utility, and stormwater management design that can be used for preliminary approvals and budgeting. In any land development project, cost is a major factor. Watermark will work with our clients to make sure that the project budgets are set up realistically and that goals are met during the construction phase of the project. Stormwater is an important piece of any land development project. Watermark will review the local ordinances and requirements in order to prepare stormwater calculations for the development. We work with our clients to determine the best options for meeting their goals while satisfying the local stormwater requirements. Upon review and approval of the Preliminary Site Plan and/or Preliminary Engineering Plan, final construction/permit design drawings will be prepared to meet the requirements of the client and the known governmental review agencies. Typically, the plan set will include, a Cover Sheet, Geometric Plan, Grading Plan, Utility Plan, Soil Erosion Control Plan, Project Details Sheet, and Project Specifications Sheet. Project cost is important for a variety of reasons. Clients want to budget appropriately and agencies want to understand the scope of projects and obtain financial guarantees prior to issuing permits. We will prepare detailed cost estimates for the site work as needed throughout the project in order to meet these objectives. Watermark will combine the existing topography with the proposed improvements and drainage studies to prepare a comprehensive stormwater management plan. Because we cross train our staff in engineering and landscape design, we understand how to address stormwater in a way that is highly functional, environmentally friendly, and aesthetically pleasing. Stormwater Pollution Prevention Plan (SWPPP) is a strategy for construction projects to comply with Federal and State stormwater regulations. Watermark will prepare a binder which includes all the required forms, plans, and permits needed to construct a project requiring an NPDES permit from the State. The binder generally includes information on legal requirements, site specific data/instructions and all necessary forms, certificates and performance standards for the project. If necessary, the SWPPP will be prepared to also meet the requirements of local agencies having jurisdiction over soil erosion control design and activities. Watermark will provide “qualified personnel” to inspect your site at the required intervals and after significant rainfall. These inspections will look at all elements of soil erosion control (designed or otherwise), with respect to established standards. We will prepare a report after each inspection which will include a summary of recommendations to obtain compliance with the provisions of the NPDES permit. Throughout the process we help facilitate the necessary steps in order to close out the permit as efficiently as possible. 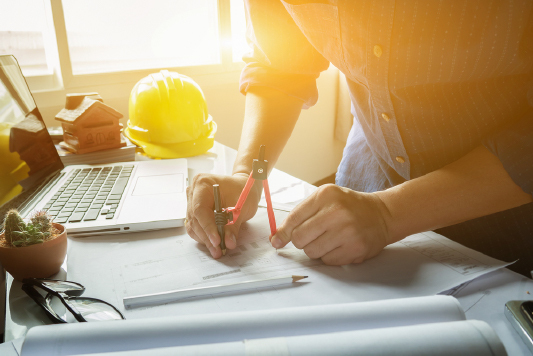 Designing and inspecting a site to meet the requirements of the Americans with Disabilities Act (ADA) is not a simple task. This element of design has a profound impact on all facets of a project. Watermark team members have a deep understanding of ADA requirements and how they affect your site. We bring this expertise to every project and are able to inspect sites for compliance in the pre and post construction conditions. Watermark has trained site lighting designers on staff that work closely with our engineering team to provide thoughtful and common-sense Site Lighting Plans. We strive to design cost effective solutions to evenly and safely light your site. These plans serve as a part of our overall engineering design, and help our clients acquire the necessary approvals and construct the site lighting seamlessly with the rest of the project. Once a project nears completion, it is common for agencies to request that as-built information be gathered and assessed by a Professional Engineer. We spearhead these efforts by either visiting the site, or coordinating with a licensed surveyor to observe and convey the as-built condition. We take this information and produce the requisite Final Punch List, Security Reduction Request, or Record Drawings. After the projects have been designed, clients want to get started with construction as soon as possible. We will work with the agencies that have review jurisdiction over the site related improvements in order to obtain the required permits and approvals. There are many agencies and Watermark has the resources and experience to get your project through the review process quickly and efficiently. We pride ourselves on building professional relationships with these agencies that help us produce positive and timely result for our clients. Certain projects necessitate improvements to existing roadways or even the creation of new ones. Watermark has the design expertise to assemble the necessary roadway improvement plans your project requires. We will coordinate with outside consultants to assist with any specialized roadway or complex intersection designs. Watermark has the experience and knowledge to represent our clients in all types of situations including testifying as an Expert Witness in the field of land development.